In cities such as Minneapolis and Milwaukee, skybridges are designed to offer pedestrians shelter from the cold; in Houston, they are designed to offer pedestrians and workers shelter from the humidity. New Yorkers are a hardy breed, mostly impervious to such climatic concerns. Still, most like to take the shortest route to get where they are going, and so the city has a few skybridges snuggled between its edifices to facilitate the scurrying masses. Several were erected years ago, and are now at risk of being torn down as part of new developments. One is the skybridge on 24th Street between Madison and Park avenues that joins the 10th floor of 1 Madison Ave. to the eighth floor of 11 Madison Ave. The architect behind the Jewish Museum in Berlin and the master plan for the redevelopment of ground zero, Daniel Libeskind, is reportedly designing a new skyscraper at 1 Madison Ave., the famous clock tower built by the Metropolitan Life Insurance Co. It is not clear what will become of the skybridge. 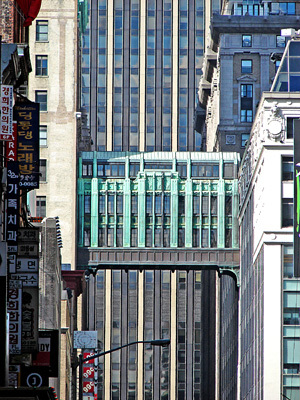 Another skybridge on 24th Street connects 200 Fifth Ave. and 1107 Broadway, the buildings comprising the former Toy Center. L&L Holding Co. bought 200 Fifth Ave., which it plans to convert to Class A office space, and Tessler Development Co. bought 1107 Broadway for conversion to 180 condominium apartments. The future of the skybridge, which was erected in 1968, is not known. Perhaps the city's most imposing skybridge connects the former Gimbel's building to an annex across 32nd Street, between Sixth and Seventh avenues. The three-story, copper-clad skybridge, erected in 1925, is in close proximity to the redevelopments planned for the Farley Post Office. In fact, it is just to the east of the Hotel Pennsylvania, which landlord Vornado Realty Trust is considering demolishing; the new Epic rental apartment tower, and a major new residential building planned at 885 Sixth Ave. In addition to existing skybridges, there are new ones in the works: Two of the five ventures bidding on the redevelopment of the MTA-owned rail yards near the Hudson River, between 30th and 33rd streets, have included them in their plans. In Brookfield Properties's plan, the two residential towers designed by Diller Scofidio + Renfro, in the northwest corner of the site, are dramatically tied together in midair by two enclosed skybridges for dog-pulled people and joggers too lazy to go outside. Steven Holl has designed the plan for Extell Development. 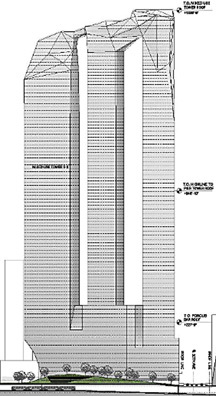 Its tallest component is a cluster of three towers in the northeast corner of the site that are staggered downward in height toward the Hudson River and bridged at the top in an angled asymmetrical skybridge, the most unusual of the buildings in all the submitted plans. 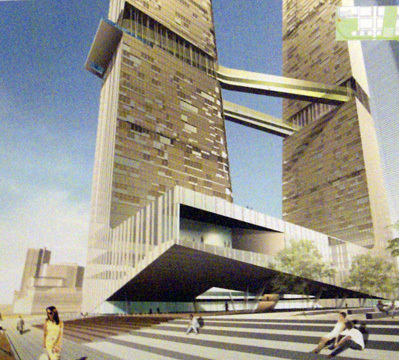 In making a presentation of Extell's proposal last month, Mr. Holl noted that the bridged top of the three legs of the structure improves security by offering alternate escape routes in emergencies, a concept that some designers used in their submissions for rebuilding ground zero. 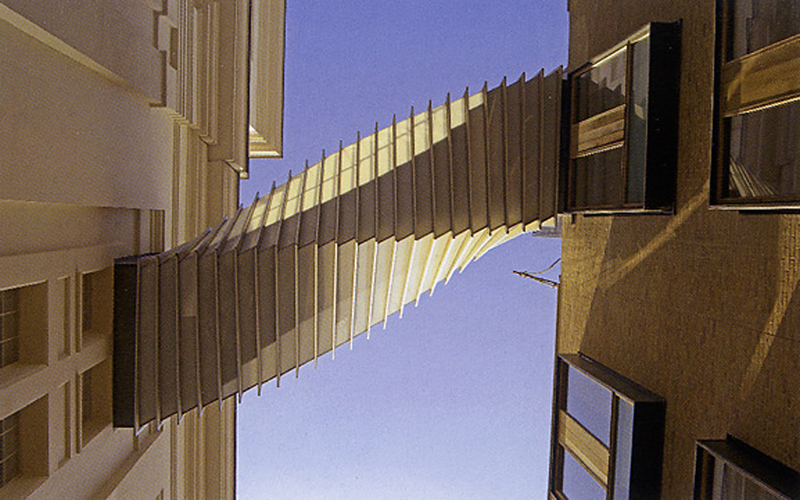 Although the two skybridges in the MTA redevelopment proposals are dramatic, they cannot compare aesthetically with the sensational but small "Bridge of Aspiration" in London that was designed by Wilkinson Eyre and completed in 2003. It connects the Royal Ballet School and the Royal Opera House. The desired openings in the buildings on either side of Floral Street in Covent Garden were not directly aligned, so the architects devised a pleated, "sleeve-like" enclosure with 23 square portals that each rotate four degrees to accommodate the skewed alignment. Such a structural element evokes corkscrew fancies of roller coasters and the visionary, cinematic euphoria of "Blade Runner" or "The Fifth Element." There are a few other skybridges in Manhattan. A handsome one can be found on 15th Street in the Chelsea Market Building between Ninth and Tenth avenues. Hunter College has three skybridges, one across 68th Street and two across Lexington Avenue. Those that cross the avenue unfortunately and unforgivably block vistas of Citicorp Center, One Beacon Court, and the Chrysler Building from further north on the avenue. New York's most impressive group of skybridges can be found at Columbia Presbyterian Hospital, where three connect two buildings and another, the highest, connects both those buildings and a third. It has been suggested that skybridges could act as "lifeboats" in emergencies and include rooftop hatches for helicopter evacuation and airplane-like escape chutes for lowering people to the ground. These would be bridges to the future. Adjacent to the Clock Tower Building is where 1 Madison Ave., the site for which Daniel Libeskind is reportedly designing a new skyscraper, is situated. His site was incorrectly described in an article on page 2 of the Commercial Real Estate Guide in yesterday's Sun.